Noted danseuse and Padma Bhushan recipient Mrinalini Sarabhai passed away today morning in Ahmedabad. She was 97.She had been admitted to hospital a day before. 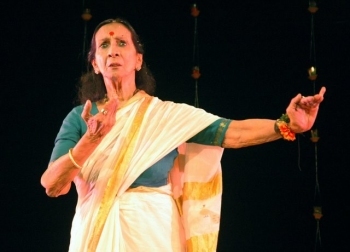 Trained in Bharatnatyam, Kathakali and Mohiniyattom, she was educated at Shantiniketan under Rabindranath Tagore. She was married to the architect of India's space programme, Dr Vikram Sarabhai. Besides being a classical dancer, she was a poet, writer and environmentalist and played a leading role in the social and art scene in Ahmedabad. She was one of the first classical dancer to turn to choreography.